Lilac LaRoux and Tarver Merendsen are only two of the thousands of passengers aboard the Icarus, a massive spaceship traveling millions of miles through hyperspace. Lilac is untouchable, the daughter of the richest man in the universe–a man who will do anything to ensure his daughter’s safety. Tarver is a war hero, and has worked his way up from a poor life to one where he is allowed to mingle with the rich. He normally would want nothing to do with a girl like Lilac, but when the Icarus is suddenly yanked out of hyperspace, he finds himself in an escape pod, alone with her. When the escape pod crash lands on an unfamiliar planet, Lilac and Tarver must travel for days in order to find help. They are forced to rely on each other, and when they discover the secret behind the whispers following them, they wonder if it may be better to stay on the planet rather than be rescued. I have heard so many wonderful things about this book and I am so glad I finally gave it a chance. This is definitely one of the best books I’ve read in awhile. The story was very original–there aren’t many YA books that take place in space other than the Across the Universe trilogy, and Kaufman and Spooner did a great job of world building both on the Icarus and on the planet. The Icarus is a huge spaceliner that sort of reminded me how the Titanic was set up–the lower class was only allowed to stay on the lower decks and was basically locked down there while the upper class stayed on the upper levels of the ship and were privileged to all sorts of luxuries. Tarver had spent his whole life as part of the lower class but now that he is considered a war hero he is given upper class status. He has the odd experience of seeing how the other half lives, and finds it hard to fit himself in their world. I loved both Lilac and Tarver, and I think the fact that the book alternated between their points of view helped the story. Lilac first comes off to Tarver as a spoiled rich girl who treats everyone as though they are beneath her, but when we get Lilac’s point of view it becomes evident that she is terrified of what her father will do to any man she shows interest in, which is what causes her to snub Tarver. Tarver is a true soldier and hero–even though he thinks of Lilac as a brat, he still does whatever he can to save her life and make sure that they are found by her father’s people, even though he knows he may be punished for being alone with her. They are both really strong characters in their own way–Lilac walks for miles in high heels without complaining as Tarver expected she would–and they end up bringing out the best in each other. This books is a really beautifully written story about survival and trust, and will definitely keep you turning pages. I loved watching Lilac and Tarver’s relationship change and develop, and how they went from being wary of each other to completely trusting in one another. The sci-fi aspect was really well done also–when Lilac and Tarver are traveling across the planet, Lilac begins hearing whispers that follow them. When they finally discover what is causing the whispers, it is something they never could have imagined and completely changes their view on many things. 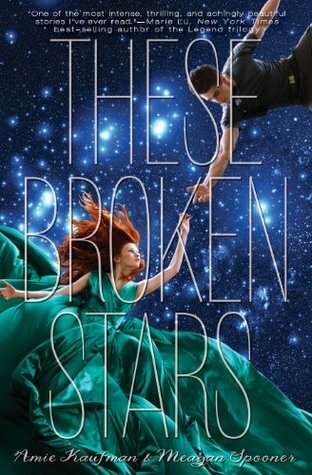 Overall, These Broken Stars was an incredible, original, and extremely well written story. This was one of the best books I’ve read in a long while, and I highly recommend it! These Broken Stars was released on December 10, 2013 and is the first book in the Starbound series. The second book, This Shattered World, is a companion novel set to be released this year.